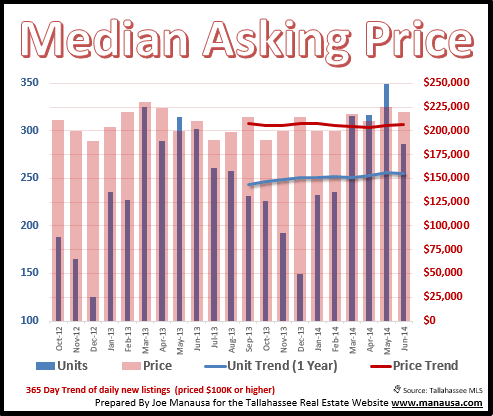 We often discuss the median home price (or median home value or size) as a way of describing the hottest price point in the Tallahassee real estate market. By way of reminder, the "median" is a mathematical concept that indicates that one half of the homes are higher in price and one half lower in price (or value or size, etc.). The median is the middle, and the middle of the market can tell us a lot about the most popular homes in Tallahassee. But today, we are going to take a look at a different median, we are going to look at the median of newly listed homes for sale in the group of homes that are most often occupied by the owners (meaning lower percentage of investor owned homes). This makes today's report much more pertinent for people who are thinking about selling their home for the purpose of buying another. Today's report will focus on all new listings in the Tallahassee real estate market that are priced above $100,000. A larger than normal percentage of homes priced below $100K are purchased and sold by investors, so keeping above this point gives a cleaner understanding of what owner occupants are doing in Tallahassee. Last month, there were 286 homes listed for sale in Tallahassee priced above $100,000, which was 5% fewer homes than were listed in June 2013. The median home price was $220,000, which is 5% higher than what was recorded a year ago. In the real estate graph above, the number of homes listed (units) are shown in blue and measured on the left vertical axis, while the median asking price is shown in red and measured on the right vertical axis. Currently, we see that the one-year trend of units listed is on the rise (more people are putting their homes on the market now than last year), while the median home price is not changing much at all. 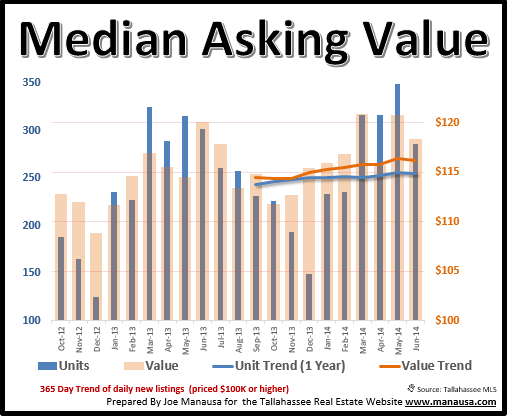 The middle home value in Tallahassee last month (for homes with asking prices above $100K) was $118 per square foot. That is down 1% from June 2013, but the orange line in the graph below shows that the trend shows median asking values are on the rise. Whenever we see median values moving in different directions that median prices, we know that the median home size is the culprit. Remember, values are "what sellers are getting" while prices are "what buyers are spending." If buyers are willing to spend more, it does not necessarily mean that sellers are getting more, buyers might just be buying nicer homes. 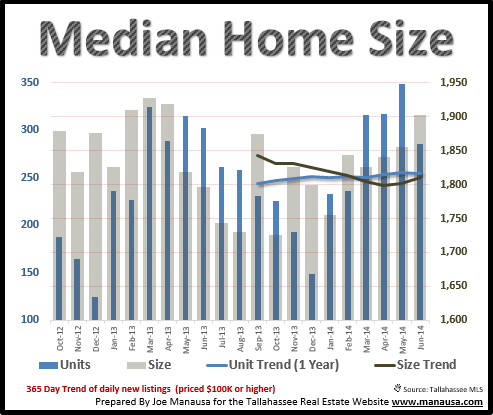 The median home size for homes listed above $100,000 in Tallahassee was 1,902 square feet, up 6% from one year ago. The general trend had been on a decline with rising interest rates, but rates reversed two months ago and buyers turned their renewed buying power into larger homes, making the market appear open for sellers with larger homes. You can use your knowledge of the median home price and other statistics and reports that we provide to help you gain an advantage in your next real estate transaction. Do you want to know how? Just drop me a note and we can schedule a time to review your needs and wants when selling and buying a home.